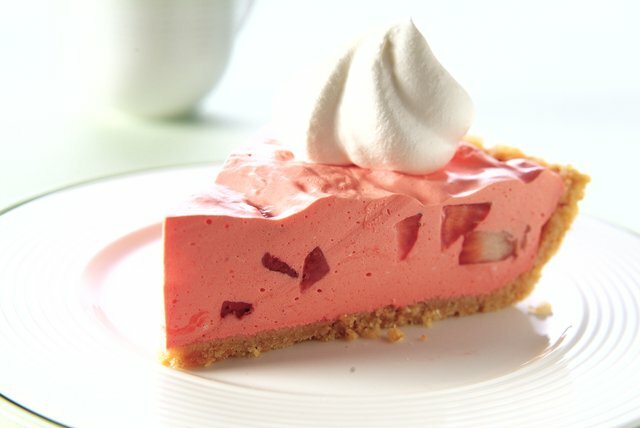 This easy no-bake pie doubles up on the berryliciousness with strawberry flavor JELL-O Gelatin and chopped strawberries. Stir boiling water into dry gelatin in medium bowl at least 2 minutes until completely dissolved. Add cold water; stir. Beat cream cheese in large bowl with wire whisk until creamy. Gradually add gelatin, beating until well blended. Place bowl of gelatin into larger bowl of ice and water. Let stand 5 minutes or until thickened (consistency of unbeaten egg whites), stirring occasionally. Add whipped topping; beat with wire whisk until well blended. Stir in strawberries. Refrigerate 20 to 30 minutes or until mixture is very thick and will mound. Spoon into crust. Refrigerate 3 hours or until firm. Garnish with additional whipped topping and strawberry halves just before serving, if desired. This variation of a classic dessert is the perfect choice for a special occasion. Plan ahead and eat accordingly before indulging in a slice of this pie. Place unopened 8-oz. tub of whipped topping in refrigerator for 4 hours. Do not thaw in the microwave.